Most patients who need tooth extractions find great comfort in the familiarity of their own dentist’s office and team. That is one of the reasons Dr. Olivia Hart performs extractions in-house, without the need for referral to a specialist in most cases. She believes patients in the Richmond, VA area deserve this level of comprehensive care. Extraction and replacement of the tooth with a dental implant can be a good alternative to root canal therapy. The endodontic treatment leaves a dead tooth embedded in bone, with pathogens sealed inside, where they may migrate to surrounding tissues. Some dentists routinely recommend extraction of healthy teeth to avoid crowding or to prepare for braces. Again, Dr. Hart takes a conservative stance, preferring to create space in the dental arch with Advance Lightwire Functional (ALF) orthodontics, or the Myobrace concept. Likewise, if a person is missing multiple teeth, some dentists suggest extraction of the remainder, presumably as a cost-saving measure, then fit the patient with complete dentures. Dr. Hart works to save healthy teeth, with options such as partial dentures, dental implants, and implant-retained dental bridges. One stop for wisdom tooth extraction, too! 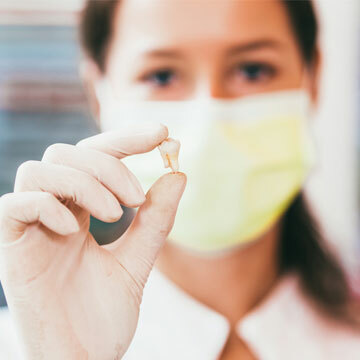 When extractions are in the best interest of your health and wellness, they are performed at Richmond Family Dentistry with minimal emotional stress or physical trauma. Simple extractions generally require only local anesthetic, with perhaps nitrous oxide to calm a nervous patient. Contact Dr. Olivia Hart of Richmond Family Dentistry if you think you might need a biological tooth extraction. Click here to make an appointment now or call (804) 381-6238 to learn more.